This project will generate new geoscience information for mineral explorers in the highly prospective Toodoggone River area in northern BC. The Toodoggone River area in northern BC is highly prospective and hosts several significant epithermal and porphyry mineral deposits, including Centerra Gold’s Kemess copper and gold mine. Until recently, exploration activities have mostly focused on specific styles of mineralization and on areas where high-grade ore is found. This project will evaluate the range of individual mineral deposits and occurrences in this district together to help reconstruct the shape and depth of a possible larger, continuous system. This model will help identify areas of high prospectivity to better define the region’s mineral potential. The new earth science information generated by this project will help attract mineral exploration investment to the Toodoggone River area. The area is relatively remote, and field work is only possible for part of the year, so this work will assist exploration companies to focus their efforts in the narrow window of time when field access is possible. Knowledge of the mineralization and alteration styles present, in the form of easy-to-access and well-illustrated descriptions of alteration and rocks, will provide guidance for important exploration decisions. This earth science data also provides First Nations, regional districts, governments and local communities with a better understanding of the resources in their area, leading to more informed land-use and resource management decisions. The Toodoggone is a remote area between Smithers, Dease Lake and Fort Saint James in northern British Columbia in the territories of the Tsay Keh Dene, Takla, Tahltan, and Kwadacha First Nations. 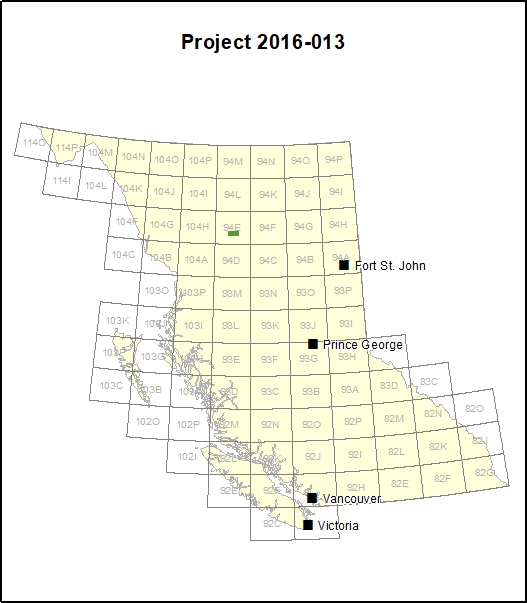 This study will focus on a 2,400 km2 area within the NTS map sheet 94E. Road access to the area is limited. In geological terms, the Toodoggone River area represents the eastern extent of the Stikine terrane and is separated from the prolific ‘Golden Triangle’ by younger sedimentary rock of Bowser and Sustut Basins. Centerra Gold’s Kemess East (KE) and Underground (KUG) projects are in advanced stages of exploration and development respectively and the nearby Kemess South open pit mine was in production from 1988 to 2011. The KUG deposit is a copper-gold-silver porphyry deposit and the KE deposit is a copper-gold-silver-molybdenum porphyry deposit. The Toodoggone River area is also host to the idled Shasta epithermal gold-silver mine and Baker mill. Both porphyry copper and epithermal silver and gold deposit types found in the Toodoggone River area are possibly part of a larger, continuous mineral system.